Intuition Pumps is Dennett’s attempt to solve this very problem. In an extensive series of very short chapters, often only a few pages long, his aim is to equip the reader with an armoury of thinking tools. 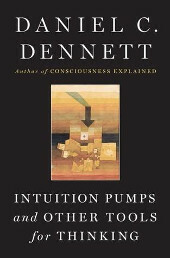 These tools or pumps, mostly taking the form of simple and well-known thought experiments, guide us slowly, inexorably towards Dennett’s conclusions; namely that free will is an illusion (albeit a useful one we need not discard, the Compatibilist stance) and that consciousness is nothing but a by-product of mechanical processes in our brains. Not the most romantic of opinions admittedly, but certainly the one bearing the closest resemblance to the ever-expanding mountain of evidence provided by neuroscientists and psychologists alike. It also happens to be the view I’ve shared ever since my degree in Mental Philosophy. So, how does he fare in guiding novices and old hands alike towards his desired goal? Well first, to be clear, this book is indeed accessible to the lay reader despite its daunting mix of content from computer programming to gestalt psychology and all stops in between. In fact the book’s structure makes it all the easier for non-experts to get up to speed with the less familiar concepts, while Dennett provides handy guidelines as to which sections can be skipped by the pro’s. The books initial sections are more or less Critical Thinking 101, training the reader to analyse the arguments they encounter and specifically to be on the lookout for certain classes of error. He provides bite-sized guides to basic notions familiar to all philosophy students such as the Reductio Ad Absurdum as well as his own extensive list of polemical errors (‘rathering’, ‘Goulding’ and so on). Key among these is his command to all readers to tweak the controls of any thought experiments or analogies cast before them – play with the variables, break out of the boundaries imposed by your interlocutor and see if it still holds water. Much fun to be had! Soon the topic moves to computing, and here you actually have to get your hands dirty by imagining the most basic of machines and considering how to program it using a limited vocabulary. This leads slowly into evolution, a topic with which any Dennett reader will be familiar. Evolutionary theory underpins every aspect of his thinking and he is rightly evangelical about it given that it is possibly the most successful thinking tool we have ever encountered. Doubting Thomases be wary. It’s only in the closing chapters of the book that we get to the really meaty topics, free will and conscious experience as viewed from an arch-materialist’s perspective. By this point it’s somewhat harder going and readers should be reminded that there’s no shame in backtracking to wrap your head around any number of points. Hell, I do it all the time and I studied this for four years! For my money the book is a resounding success. I will admit that I may be biased in that I already agreed with his conclusions (more or less) before beginning the book. However, the path down which he leads his audience is straight and true. It was carved out by classes of Philosophy graduates in Dennett’s own classes where he tested the material, all the wrinkles ironed out before publication. While some similar tomes can feel like a mental struggle this was more like being pulled towards your by a welcome and increasingly strong current. That’s not to say the book won’t have its critics. Dennett pulls no punches when confronting the likes of John Searle and Stephen Jay Gould on their stances regarding artificial intelligence and evolution respectively. Supporters of these camps will no doubt attempt to pick holes but try as I would to be Devil’s Advocate I could find precious few chinks in the armour, and no significant ones. Honestly the only fault I could find was the familiarity of much of the material, large swathes of it being pulled from his previous books and other publications. For the Dennett newbie this will not be a problem though, so I can let it slide. Will Intuition Pumps succeed in changing the minds of staunch dualists, anti-evolutionists, AI doubters or free will advocates? I’m not sure. The arguments contained within are sound but it’s well known that rational argument tends to have little effect on the already entrenched. On the other hand, as an introduction to the fundamental interconnectedness of the range of topics it covers – philosophy, critical thinking, computation, AI, evolution, free will and consciousness – it’s difficult to think of a better volume. Easily digestible but substantial enough to give you plenty to meditate on for months, as well as exponentially increasing your reading list. Another victory for advocates of rationalism, skepticism and the scientific method.